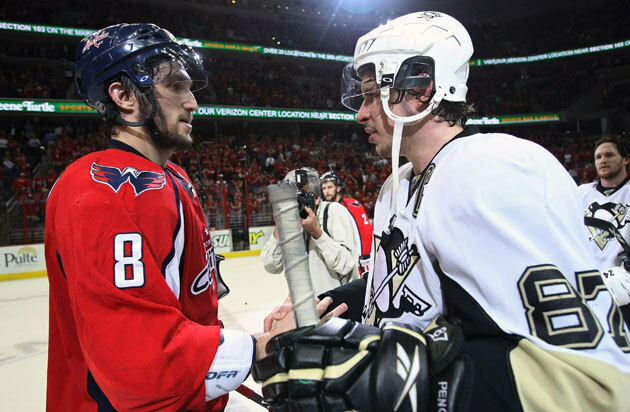 WASHINGTON -- There have been so many memorable moments, so many indelible images in the careers of Alex Ovechkin and Sidney Crosby since they were the No. 1 picks in back-to-back NHL drafts. Yet the outcome of one shot could have made everything different. 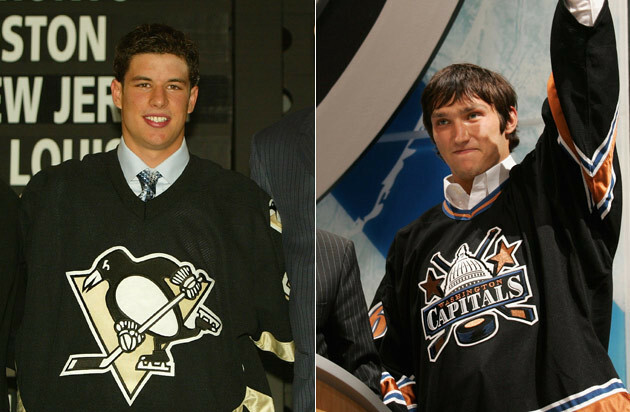 The two superstars had willed their teams, Ovechkin's Washington Capitals and Crosby's Pittsburgh Penguins, through six games of an epic, breathtaking Stanley Cup Playoff series when they collided in a winner-take-all showdown on May 13, 2009 in the Chinatown district of the nation's capital. The series, which offered the potential for greatness then delivered beyond anyone's highest expectations, had reached its climax. Less than three minutes into Game 7 at Verizon Center, Ovechkin collected in stride a puck that had caromed off the boards. The red-clad crowd rose to its feet as its favorite Russian locomotive steamed past a helpless defenseman and moved in alone toward the goaltender. A shoulder fake suggested he might go to the the left, but goaltender Marc-Andre Fleury suspected a move to the right to put Ovechkin on his preferred forehand shot. Fleury snatched the shot from the air with his glove and an entire city of hockey fans returned to its seats in utter disbelief. What followed the save was a nightmare in Washington that day, and sheer jubilation 250 miles to the northwest in Pittsburgh. So much that has changed for Ovechkin and Crosby can be traced back to that one shot, the opening salvo in what would turn out to be a 6-2 win for the Penguins. "I still remember Ovechkin having that breakaway, and if he had scored, who knows what could have happened?" Penguins general manager Ray Shero said. "They probably wonder the same thing. It was the two marquee players in the game at that time and those two teams playing just an incredible series. That was a fun series to be part of. It could have gone either way. It was that close." To that point in their careers, Crosby and Ovechkin had jostled for individual awards and for the unofficial title of "Best in the World," but that 2009 series became a defining moment. Crosby scored the first goal and the last for his team in the Game 7 rout, an anti-climactic ending to one of the great playoff series in NHL history. More importantly, a few weeks later, Crosby's team went on to the win the Stanley Cup. Ovechkin's club has yet to advance beyond Game 7 of the second round. The following year Crosby scored one of the biggest goals in his Canada's history to secure the gold medal at the 2010 Vancouver Olympics, just a few days removed from his team routing Ovechkin's Russia in stunning fashion in the quarterfinals. 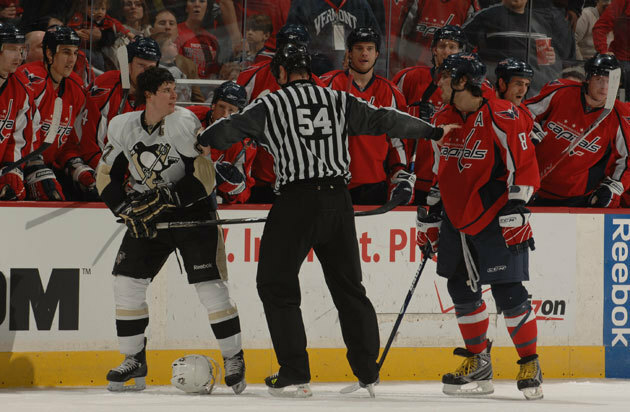 In the two years that followed the 2009 postseason showdown, Capitals-Penguins was the most-anticipated rivalry in the League with Crosby and Ovechkin as the dueling faces of the sport. Then, in part because of injuries for Crosby and a dip in form for Ovechkin, the Capitals and Penguins stopped being appointment television for millions of hockey fans. Last season, however, they returned to the top of the NHL food chain. Crosby dominated for 36 games before missing the final 12 in the regular season with a broken jaw, but still nearly won the scoring title despite missing a quarter of the season. Ovechkin started slow with a new coach but went on a remarkable scoring spree to win his third Rocket Richard Trophy as the top goal scorer and his third Hart Trophy as League MVP. Crosby finished second in the Hart voting and won the Ted Lindsay Award, the MVP honor bestowed by the National Hockey League Players' Association. This season, the two franchises are back in the same division after 20 years apart. Each spent time this past week in first place in the new Metropolitan Division, and they crossed paths for the first time Wednesday night with first place in the division on the line in NBCSN's Wednesday Night Rivalry series. "I think the games have brought out the best in us, both individually and with our teams," Crosby said. "It's been eight years. It has gotten heated at times, but I think for the most part it's brought out the best as far as our games are concerned. It helps us because we want to be good for our teams and there have been some great games. For the fans, I'm sure they've enjoyed it." In the wake of that Wednesday meeting, NHL.com in the Sunday Long Read examines the individual rivalry that has defined an era and a team rivalry that was once great and soon could be again. For a sport typically played inside arenas, weather has helped create some of the most surreal moments in the rivalry between the Capitals and Penguins during the Ovechkin-Crosby Era. When games between the teams were highlights of the NHL season, they played matinees on back-to-back Super Bowl Sundays. In 2010, a massive storm rocked Washington, leaving the game in doubt. With the city covered in two feet of snow, the teams played what will always be remembered in this area as the "Snowvechkin" game: a 5-4 overtime victory for the Capitals. Crosby scored the first two goals, and Ovechkin answered with a hat trick to help force overtime before Mike Knuble's rebound at the goalmouth let Washington prevail. The following season, the League decided it was time to take the rivalry to a new place: outdoors. Washington and Pittsburgh met in the 2011 Bridgestone NHL Winter Classic at Heinz Field, a game that reached beyond hockey fans because of the introduction of HBO's "24/7" documentary series, which provided viewers with an all-access look at both teams in the lead-up to the New Year's Day contest. It might have been the peak of the rivalry's popularity. It also became the first game in NHL history to be played in the rain, which added another surreal element after it had already been moved to prime time in an attempt to capture optimal weather conditions. The Capitals won, and again a scramble near the crease with Knuble punching the puck across the line played an important role. Defeating the Penguins at the home of the Pittsburgh Steelers on the game's biggest regular-season stage will be cherished for a long time by the Capitals and their fans. "We hated them," former Capitals coach Bruce Boudreau told NHL.com. Boudreau now coaches the Anaheim Ducks. "When I lost my first game that we played against Pittsburgh, I'll always remember [owner] Ted Leonsis coming up to me and saying, 'I hate losing to these guys. I hate it.' It came from all of the series in the past. They've won the Cup and that's how it was portrayed in that HBO series. "They were the pretty boys and we were the guys from the wrong side of the tracks. Whenever we played Pittsburgh, it was always such a big battle and we always wanted to win desperately." On this Wednesday in Washington, the weather would have no impact; it was a picturesque fall day. The Penguins had spent every day but one of the 2013-14 season in or tied for first place in the Metro, the new division that housed old rivals from the days of the Patrick Division, which served as the original hothouse in growing the rivalry between the franchises. The one day they did not sit in first place was Monday, after the Capitals defeated the St. Louis Blues and leapfrogged the Penguins by a point. The win against St. Louis was the seventh victory in nine games for Washington, which got off to a slow start for the second consecutive season. Ovechkin scored twice against the Blues, giving him 17 goals in 21 games and tying him for the League lead. The goal-scoring form was carried over from the end of the 2012-13 season, when "vintage Ovechkin" returned to Washington after two seasons as a mere mortal. He fired home 23 goals in the final 23 games of that campaign, meaning he entered the game against Pittsburgh on a run of 40 goals in 42 games. After scoring at least 50 goals for three consecutive seasons, Ovechkin's total dropped to 32 in 2010-11 and 38 in 2011-12. Though Crosby missed extensive time after being first diagnosed with a concussion then a neck injury, Ovechkin did not seize the time alone in the rivalry's spotlight to become the game's undisputed top player. Instead, there were two coaching changes, and more playoff disappointment for the Capitals. Now, though, Ovechkin is scoring goals at greater pace than when he authored the highest total by a left wing in League history with 65 in 2007-08. "It is a pretty good accomplishment. It is just going in," Ovechkin said of 40 goals in 42 games. "I feel pretty good about myself. I feel my shot is very powerful right now. I know if I'm going to take a good shot right now almost 80 percent is going to go in. "I always was here. I didn't go to Miami or Jamaica. I was here. ... It's a situation when you don't score goals, when you don't make assists, everyone thinks you're bad. Sometimes you don't have your great game, but you get points and everybody thinks you play well. Sometimes you have to see in a different position, where maybe you didn't score goals but you make hard work or make the different plays for your teammates. It's more than goals." Crosby began this season like he did the last one, by claiming an early lead in the scoring race. He had 17 points in his first eight games, collecting points at a level more commensurate with the days when Mario Lemieux, the current owner of the Penguins, and Wayne Gretzky toyed with ill-equipped goaltenders and rudimentary defensive systems. The Penguins, trying to move past the disappointment of being swept in the Eastern Conference Final in June, won seven of those eight games. Then the offense sputtered, the team lost seven of 12. Crosby had eight points in that span, acceptable for many; but expectations are, of course, different for Crosby and Ovechkin. Pittsburgh shrugged off a weird start Monday night at Consol Energy Center to defeat Boudreau's Ducks 3-1 and move back into first place in the Metro. Crosby scored the final goal, tying him with Alex Steen of the Blues atop the League leaderboard with 26 points. "I think eight years ago when both guys came into the League at the same time, I remember thinking it was exactly what the League needed," Shero told NHL.com. "They haven't disappointed. At such young ages, they were such great players. They were the faces of the League. Coming out of the lockout, the League needed guys like that. They did their part and so much more. The excitement level they helped bring to the game was tremendous. "Now to see where they are eight, nine years later and through some ups and down for both players ... I think the great news is they back to being the star players they are. Maybe even greater news is there other great star players that the League can hang its hat on now too as well. I look at [Ovechkin] and Sid and I'm sure they're pretty happy about that. They are back having great years though, and I'm sure there are many more to come." The arrival of a transcendent player in each market and a return to postseason relevance has resulted in Verizon Center in Washington and Consol Energy Center in Pittsburgh, and Mellon Arena before it, being sold out on a nightly basis. Washington's arena has earned a reputation for being one of the loudest in the League, something that was far from the case before Ovechkin arrived. That reputation is most-deserving on nights the Penguins come calling. There are more people who arrive early to stand near the glass for warm-ups. There is more chanting out on F Street and 7th Street, as fans from both clubs voice their support ... and their displeasure for each other. "This building is top-three for sure and maybe second [behind Montreal's Bell Centre]," Pittsburgh coach Dan Bylsma said after the morning skate. "This is one where you know you're going to deal with the crowd and the energy in the building. You're going to hear the 'Rock the Red.' It is coming at some point in time. My picture is really Ovechkin scoring that third goal in '09 in [Game 2] and the place just rocking. Shaking, literally shaking. This is a formidable place to play." "You have a little more jump when you play this team," Washington defenseman Karl Alzner said. "That's just the way it is. I don't think it is as intense as it was two years ago. It is there, but it is not quite there. It is a good feeling when you beat them, but we don't quite talk about it as much as we did a few years ago. "I still want to beat this team more than any other, yeah." The game opened at a pace definitely above "Wednesday night in November." Washington pushed during the opening moments and drew a penalty to give its power play the chance to strike first. One of the biggest reasons second-year coach Adam Oates has been able to help Ovechkin relocate his famous scoring touch is the power play. Oates earned a reputation for being the architect of strong units in New Jersey and Tampa Bay as an assistant before getting this job, and the Capitals have been fantastic using his favored 1-3-1 alignment in his first 70 games as coach. As play continued during the delayed penalty, Ovechkin carried the puck three-fourths of the length of the ice. His first foray toward the net was thwarted, but the ensuing chaos led to three scoring chances, including one when Ovechkin put the puck through Fleury's legs but wide of the goal. A few seconds after the faceoff to begin the power play, the Capitals wired the puck around the zone and found Ovechkin an opening. He blasted a one-timer from his favorite perch in the left circle, but it rang loudly off the crossbar and skittered harmlessly away at 3:29. Crisis averted, the Penguins killed off the power play and changed the flow of the game. Pittsburgh went on the attack, and overwhelmed the Washington defense, which was missing Mike Green. The parallels between Wednesday night and Game 7 in 2009 were suddenly obvious. Washington missed an early chance to send the crowd into a frenzy and take control of the game. Instead, the visitors imposed their will. Crosby was crucial in breaking the stalemate less than four minutes after Ovechkin's near-miss. Crosby won a faceoff in the offensive zone and retrieved the puck before feeding it to defenseman Paul Martin at the left point. Martin's shot surprised Washington goalie Braden Holtby and, just like that, Pittsburgh had the lead. "I think we set the tone," Crosby said. "We got that first one and that is important for us to play the right way." Pittsburgh continued the siege. The next five shots on goal belonged to the Penguins, including one from Crosby at the doorstep to the right of the net, the exact place where he terrorized the Capitals during the 2009 playoffs. The final of the five-shot flurry found the mark. Beau Bennett's wrist shot beat Holtby to the far side at 11:57 after Pittsburgh carved its way far too easily through the neutral zone. "It was just decisions with the puck," Ovechkin said. "[Wednesday] night everybody makes mistakes in our zone. Passes, bad passes, turnovers." In the previous game for Pittsburgh, the Penguins had gone nearly 17 minutes without a shot on target to open the first period against the Ducks. That was corrected in Washington, and Pittsburgh finished with 17 shots on goal and a solid 2-0 advantage after one period. When Crosby and Ovechkin came into the League, they were anointed saviors by media members after a lockout erased the 2004-05 season. Ovechkin had been drafted No. 1 in 2004 but had to wait a year before making his debut. Crosby was taken No. 1 at the 2005 NHL Draft after the lockout's conclusion. As play began coming out of the work stoppage, there were new rules to promote offensive play. In that atmosphere, the two budding superstars didn't take long to earn places among the game's elite. Crosby became the youngest player in NHL history to score 100 points, but Ovechkin electrified crowds with highlight-reel goals and bone-rattling hits. He had 52 goals and claimed the first battle between the two, winning the Calder Trophy as the League's top rookie. The Penguins reached the playoffs the following season, and the Capitals the one after that. Pittsburgh came within two victories of the Stanley Cup in 2008, losing to the Detroit Red Wings in the Final. Washington welcomed Boudreau on Thanksgiving Day and rallied from last place in the NHL to a Southeast Division title. Crosby won the scoring title and Hart Trophy as a teenager in 2006-07, and Ovechkin followed with his incredible 65-goal performance to win the Hart in 2007-08. The accomplishments came for each, independent of the other. There had been a few head-to-head showdowns, but nothing to electrify people's imaginations. It all changed when the Capitals were able to defeat the New York Rangers in Game 7 of their opening-round series in 2009. It set up the first postseason clash between the two best players in the world. "It was just like that. James Hunt was Alex and Niki Lauda was Sidney. They were both as competitive in their own way and wanted to win more than anything else. They just had different ways of going about it. I think Alex took care of himself a little better than James Hunt did, but they were both so talented. Niki Lauda was the serious one, just like Sidney, but still had great talent and knew everything about the car. It became a great rivalry because they were so different." Game 1 was played in a frenzied Verizon Center at a furious pace, a sign of things to come. Crosby scored the first goal of the series, and Ovechkin followed later in the period to put his team ahead 2-1. The signature play came in the second period. Washington's rookie goaltender, Semyon Varlamov, in his first Stanley Cup Playoff start, reached to his right with his stick and deflected away what looked like a sure Crosby goal. The Capitals went on to win 3-2. Game 2 needs little background. It is, quite simply, the "Dueling Hat Tricks Game." If there hadn't been enough hype and anticipation, this contest delivered, turning the series into a spectacle. Again, Crosby opened the scoring, but Ovechkin took over in perhaps the best performance of his career. He scored three times and finished with 12 shots on goal. The Capitals had a two-goal lead, a rarity in this series, late in the third period but Crosby batted the puck out of the air into the net with 31 seconds remaining to complete his hat trick. But it was for naught in a 4-3 loss. "One team would push and the other would push right back," Washington forward Brooks Laich said. "Just two really good hockey teams, and it was back-and-forth. The series was very, very close up until Game 7. Just being part of it, it was the kind of hockey games you want to be a part of. They're fast, there's world-class plays from world-class players. It is the type of hockey you dream about playing when you're a kid. I think there are still going to be more games like that." The scene switched to Pittsburgh, and Ovechkin scored 83 seconds into Game 3 to stun the Mellon Arena crowd. The Penguins forged a 2-1 lead, but Ovechkin's trusted sidekick Nicklas Backstrom scored a power-play goal with 1:50 left in regulation to force overtime. With the Penguins one shot away from a 3-0 deficit in the series and little hope for recovery, they caught a break. A shot from Kris Letang from the top of the offensive zone went off Capitals defenseman Shaone Morrisonn and in the net for a 3-2 victory. Backstrom scored 36 seconds into Game 4, but again the team with the early lead was not able to hold it. Pittsburgh scored the next three, and carried play for much of the game. Crosby scored early in the third period to give the Penguins a 4-2 lead and they tied the series with a 5-3 victory. Because of a schedule quirk, Game 5 was the following night in Washington. Ovechkin scored twice, including one with 4:08 left in the third period to force overtime, but again the Penguins survived in stunning fashion. Forward Evgeni Malkin tried to pass the puck to Crosby during a rush but defenseman Tom Poti, sliding to break up the connection, knocked it into his net and the Penguins were one win from the conference final. Though Game 2 is forever etched in hockey lore, Game 6 may have been the best of the series. Ovechkin did not score a goal but had three assists. Crosby had an assist on the first goal and scored with 4:18 remaining in regulation to make it 4-4 and force another overtime. With the season hanging in the balance, Washington's David Steckel won a faceoff to the right of the Pittsburgh net then deflected a shot from Laich past Fleury to secure a 5-4 victory and deliver a Game 7. "There were just huge momentum swings back and forth," Pittsburgh defenseman Brooks Orpik said. "They won two there and we won two here. Dave Steckel scored in overtime of Game 6 and we just had that feeling of 'How did we lose that game?' It was both [Crosby and Ovechkin] going back and forth and it was pretty cool to watch. That's what I remember is the wild momentum swings." The highly anticipated Game 7 ended with a thud for the Capitals. After Fleury's momentum-altering save on Ovechkin, Crosby opened the scoring for the third time in the series. There would be no Washington comeback this time. Craig Adams scored eight seconds after Crosby. Twenty-eight seconds into the second period, Crosby set up Bill Guerin for a howitzer. Letang bombed one by Varlamov less than two minutes later, and the rookie sensation was chased as the packed Verizon Center crowd went silent, numbed by the disbelief on another stunning failure against the franchise's long-time nemesis. Jordan Staal give Pittsburgh a 5-0 lead before Ovechkin added a consolation prize late in the second period, his eighth goal and 14th point of the series. Crosby added the final insult, stripping Ovechkin of the puck and going the length of the ice before calmly tucking in his eighth goal and 13th point of the series. "That's the best one we've ever been involved in. It was really entertaining," Washington general manager George McPhee told NHL.com. "I wish it could have gone on longer. It was that good. To us, whoever won that series was going to win the Cup that year and (long sigh) ... the winner won the Cup." Thirty days after Fleury stoned Ovechkin, he made his second signature save of the playoff run, stopping Nicklas Lidstrom in the waning seconds of Game 7 of the Stanley Cup Final at Joe Louis Arena to secure the Penguins' third championship. For the Capitals and their fan base, that day remains the biggest of many "what ifs" in the franchise's history. Despite the nature of many of the games between these rivals, Bylsma said Wednesday morning he does not favor playing track-meet-style hockey with the Capitals. The Penguins, he said, are better off keeping the game stationary. The second period Wednesday was anything but stationary as the Capitals pushed to get back into the contest. Pittsburgh committed the turnovers Bylsma wanted to avoid, leading to increased pressure from Washington. Suddenly, chances were being traded up and down the ice. It was a flashback to those games between the teams before the 2011 Winter Classic when they were the two most high-powered offenses in the League, and on some nights the players on each team seemed determined to prove they were the most gifted in the League, defensive structure and game plans be damned. Eventually, the Penguins were able to settle the game before the Capitals could cut into the lead. Crosby, who had been close a couple of times earlier in the period, finally beat Holtby with 29 seconds left. The Capitals have the high-profile power play, but the Penguins, with Crosby, Malkin, Letang, James Neal and Chris Kunitz, are clearly not hurting for options with the extra man. Crosby finished one of the best passing sequences of the season for his 11th goal, the puck movement so crisp and beautiful it stole the spotlight from the near-impossible angle shot while dropping to one knee. A night that began with renewed anticipation was not going as planned for the home supporters, and it was the team in white sweaters that left the ice to a smattering of cheers for its 3-0 advantage after two periods. "Mental mistakes, it just happens when you have that kind of game," Ovechkin said. "They scored two goals and they feel pretty good about themselves. We were in a position that we have to fight through and get it back on track to make it 2-1 or 2-2, but we didn't." The 2011 Winter Classic is remembered for more than just the rain and the first time HBO brought hockey fans ugly sweater parties, hotel pranks and, of course, the bloodshot eye of Matt Hendricks. It was the first of two straight games Crosby did not finish because of an injury and the beginning of a long and frustrating journey for a player who, at that point, was halfway to one of the great offensive seasons in a generation. After Crosby collided with Steckel during the Winter Classic, he returned for the next game, but a check by Tampa Bay Lightning defenseman Victor Hedman put Crosby's head into the glass, and that would be the last NHL game he would play for more than 10 months. Crosby returned in November of the 2011-12 season. In his return, he carved up the New York Islanders for two goals and four points. He played eight games, but needed another break, and was eventually diagnosed with a neck injury. Crosby returned again in March and promptly collected nine assists in four games. The Penguins were whole again and ready to return to their status as Stanley Cup favorite. Instead, they crashed out of the playoffs after a circuslike first-round series with the Philadelphia Flyers. Last season, Crosby looked like a dominant player ready to collect his second Hart Trophy for the first three-quarters of the season, but a broken jaw sidelined him until Game 2 of the first round, and Ovechkin's late surge to get Washington into the playoff dance swayed enough voters to hand him the Hart. The Penguins loaded up before the NHL Trade Deadline and were again considered favorites in the 2013 postseason, but the Boston Bruins proved too tough to crack. Pittsburgh managed two goals in four games to flame out of the Eastern Conference Final. The freak nature of the jaw injury aside, Crosby is healthy and performing at an elite level again. His value to the city of Pittsburgh, and to the League, goes far beyond anything in a box score. "Well, at least for the city of Pittsburgh, he is probably the difference in having a hockey team," Shero told NHL.com. "Having won that [NHL Draft] Lottery and helping to secure the building and the long-term future of the Penguins in Pittsburgh. He was certainly the key driver in the turnaround of the team as well. ... I've told him this more than once. I think it was good for him to have that first year where they weren't very good. Things were real different than now. I think it has helped him appreciate it more, because he knows you can't win every year. It is hard. There's a lot of parity in the League. He knows what it like to be on a team that has 58 points." Orpik said, "He's definitely embraced it. There's a lot of guys who don't like the spotlight. He's obviously the face of the League. You really see it when we go to Canada. In Pittsburgh here it was Mario, and he passed it on to Sid, and you can see how much the youth hockey has improved. Those two guys have a lot to do with it. He's a pretty humble guy, but I think he knows how important he is to the League. There's just little things that people sometimes overlook. I've never seen him turn down a media request. We play back-to-backs and we get in somewhere at 3 a.m. and all anyone wants to do is go to bed but he always stops to sign autographs for fans. He's really conscious of his image for himself and for the League. I think he knows it, but he'll never say it." Ovechkin's troubles began earlier in the 2010-11 season. The once high-flying Capitals were slumping when the HBO cameras came to town, and the anxiety and frustration was laid bare for all to see. His offensive numbers slipped. They were strong for most NHL players, but there's only one guy who signed a $124 million contract while also becoming a conduit for controversy, including multiple suspensions for illegal hits, as well as the poor performances of his teams in the postseason and at the Vancouver Olympics. "I think there's a tremendous amount of scrutiny on him," Laich said. "Every game he is watched with a microscope. I think with Alex, like the leader on any team, he is sort of an umbrella. They protect the other guys from ever getting rained on. If something goes bad, they take the blame. They say, 'I could have done or been better.' You can certainly say that about our guy for sure." The decision to make Ovechkin the Capitals' captain was heavily scrutinized. His decision to drift back into the defensive zone on some shifts was endlessly examined. As the goals started to dry up, his perceived inability to adapt to changing defenses was highlighted. "Alex was easy to coach because he loves to play," Boudreau said. "You just had to understand that he was going to be a great offensive player but he was going to have some defensive liabilities. You accepted that and hoped the good would outweigh the bad, and it always did. You were always going to be a net-positive situation. "I never really had a problem with Alex, I don't think, until near the end. I still don't know how big of a problem it really was. I think the media made more of it than what was there, or at least I think so." Boudreau was fired in November, and the Capitals hoped former captain Dale Hunter would instill the defensive responsibility and toughness with which he played. Hunter's Capitals were better defensively, but they lost the spark of creativity that was a separator on many nights. In essence, the Capitals played coin-flip hockey, keeping games tight and waiting for the puck to bounce their way. Hunter left Ovechkin on the bench in situations Boudreau would always play him, then left him on the bench for long stretches during playoff games. Ovechkin had to deflect questions about his role, his mood and his relationship with the coach. If there was a nadir for the criticism, the 2011 playoffs was probably it. "Of course it matters," Ovechkin said when asked if he cares what people say about him. "When I [was younger], like my first couple years, it was just what I did because I didn't know nobody here. I read the front pages, news and I was crazy about it. Right now, to be honest, I don't care what people say, the media say. Of course I read this stuff, but most of the time I read it and forget it in a couple seconds." That postseason, the Capitals matched 2009 for their most successful playoffs, reaching Game 7 of the second round, but this was far from the team of rock stars that came to opposing arenas, lighting up goaltenders while winning over fans in those cities. After the playoff ouster, there was another coaching change, and it was another former Capitals star taking the reins. Oates had earned the adulation of Ovechkin's buddy, Ilya Kovalchuk, while working for the Devils. "I think [Ovechkin] has matured a little bit. I think he has settled down," said Olie Kolzig, who was the team's star goaltender when Ovechkin arrived off the plane from Moscow in 2005. Kolzig is now the organization's goalie coach. "I think the biggest change has been having [Oates] as a coach. They are both superstars. Obviously [Oates] is a very accomplished player, a Hall of Famer. I think [Ovechkin] looked at that with the utmost respect, and at the same time I think [Oates] came in and showed him a lot of respect. He sat down with him and talked with him a lot. He obviously got him to switch sides, which I think gave [Ovechkin] a new outlook on the game. I think teams were starting to figure him out, and his options were limited on the left side. "Going to the right side, teams had to adjust to him. He's protecting the puck more. He can come down with more speed and not worry about getting the puck taken off his stick. As a result, I think there was a weight lifted off his shoulders." Oates had some radical ideas about how to "fix" Ovechkin, and none more radical than permanently moving him to right wing. After a slow start, followed by a quick return to the left but with atypical linemates, Ovechkin went to Oates and agreed to give it another go at right wing. Eventually, the experiment began to click, and after Backstrom became his center again, Ovechkin exploded. He won a third Hart Trophy, becoming the eighth player in League history to do so. In the process, some of the dynamism that made him such a popular force of nature returned. "He changed the franchise," McPhee said. "He changed hockey in Washington. He's everything you could hope for in a draft pick. Some of the criticism has been really unfair, but he absorbs everything for this franchise. Other guys can just show up and play. Alex is the lightning rod, but he can handle it. He's handled it his whole life. "That's probably never happened in the history of the game, in any sport, for that matter. A guy changes positions and wins an MVP when he was already an MVP. He was coachable, and that was the thing that was most important. That doesn't happen unless you're coachable." The Penguins sucked the life out of the game in the third period while nursing a 3-0 lead. Washington failed to build any momentum, and the Capitals struggled to earn offensive-zone time, even in desperation. Neal added the final volley, carrying the puck into the offensive zone and cutting toward his left before snapping a shot under the crossbar. "I think it starts with defensively we didn't give them much," Crosby said. "We created a lot in that first period. The second was kind of 50-50. They came out harder and we turned the puck over a bit, but we shut things down in the third." Crosby finished with a goal and an assist, and the outright lead in the NHL with 28 points. Ovechkin had two shots on goal plus the one off the crossbar that remained a painful what-if after the final buzzer. Holtby yielded a couple of goals he'd like to have back, but Washington could not solve Fleury in its limited opportunities. "It was just that kind of day where you want to do something and you just can't do it," Ovechkin said. "I don't know how to explain it. There's no doubt they played great hockey. Everything was working for them. They moved the puck well. They shoot the puck well. And we didn't." Crosby and Ovechkin are no longer young starlets taking the hockey world by force. Essentially, they're considered middle-aged in NHL years, players who still look up to team elders but are now mentors to the youthful faces on their rosters. The personal rivalry between the two has rarely played out beyond wanting to one-up each other on the ice. There was a famous flare-up during the 2009 playoffs, but for the most part the competition has been cordial. The off-ice relationship between Ovechkin and Malkin, the player selected after Ovechkin in 2004, was what provided the fireworks once upon a time. "I think there was definitely some heated games there that brought out [the emotion]," Crosby said. "It was two guys who didn't really know each other that well, and it was really being built up. We're both so competitive and you want to win. He's a great player. The stretch he's on since last year is pretty incredible." There are certainly other great players in the NHL, but few who can transcend normality the way Crosby and Ovechkin do. None are intrinsically linked, either, in the way Crosby and Ovechkin remain bound. They finished 1-2 in the Hart Trophy voting last season after each scored 56 points. They are early Hart contenders this season after fast starts. Their teams also remain linked, currently battling for the top spot in their new division. A pennant race between the teams would add a new wrinkle to the proceedings. The new playoff format could also lead the two franchises to more encounters, a return to the frequency with which these teams met in the 1990s under the old divisional format. As Alzner put it, the rivalry is there, but it's not pulsating with the contempt and intrigue that defined it a few seasons ago. That could change in a hurry though as this season progresses. "It really escalated and climbed to new heights when we played in the playoffs," Laich said. "I think as we keep going, especially with the new realignment, it is even going to take more and more steps as we play them more in the playoffs. I think the best is still yet to come. They're both back to being amazing players and I think there will be more great playoff games to come."